We did it! 9 REO (bank owned homes) in about 90 minutes! Following our first time homebuyer seminar last Thursday, Saturday’s caravan was intended to show a variety of neighborhoods, price ranges, and condition of homes (some gorgeous, some “fixer uppers”) in Ventura. We call it “speed dating” because we’re into and out of each home FAST – 5 minutes max! 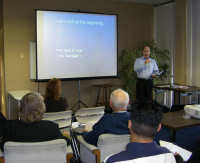 We had about 16 people attend our first time homebuyer seminar last night at the CitiBank conference room in Ventura. 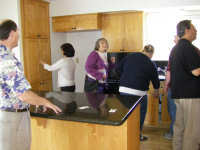 Don covered the new $8,000 first time buyer tax credit and financing. In the second half, I covered “reality checks” first time buyers face, plus reviewed the Residential Purchase Agreement which covers the rights and responsibilities of both the buyer and seller. Tomorrow (Saturday) we take these folks on a “speed dating” caravan of REO properties in Ventura – weather looks great for a fun morning! Today is Saturday morning and Leslie and I are back from my Tenant in Common Association (TICA) conference in San Diego. With the bombshell announcement by the Fed on Wednesday, I was curious to see how fast interest rates would soften, so this morning I checked a mortgage rate sheet we get daily and was pleasantly surprised to see that rates have softened by about 1/4%. Not too shabby! It would appear the Fed’s decision is starting to have its intended impact on the mortgage market. After yesterday’s post about the Fed pumping 1 trillion into bond purchases, Bill, a client, emailed me this website that pictorially shows what one trillion dollar bills look like – unbelievable! Thanks Bill. Comments Off on What does 1 trillion dollars look like? You are currently browsing the Don Nelson Team blog archives for March, 2009.